No matter how much planning goes into Thanksgiving, I always manage to forget something until the very last minute that threatens to derail the entire meal. Last year it was place cards. Okay, maybe I'm being a little dramatic about the derailment part, but the type-A person in me gets really frustrated when a great plan does not come together - especially when it's a party. The only items I have to construct the place card are black and white cardstock paper, yellow ribbon and a pair of scissors. A. 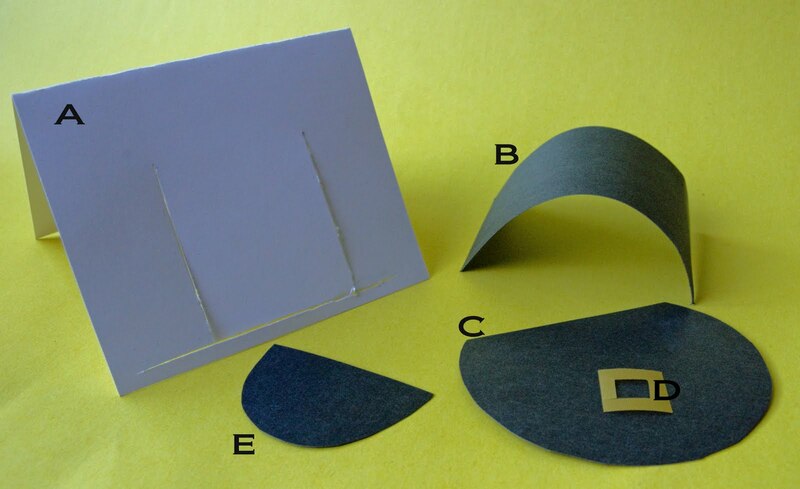 Cut and fold the white cardstock paper in half to make a tent. Then cut 2 parallel slits vertically and 1 long horizontal slit across the bottom. B. Cut out a small rectangle using the black cardstock paper and slightly bend it into a "U" shape. Insert each end of the "U" into the parallel slits in the white paper. C. Cut out a circle using the black cardstock paper - the diameter of the circle should match the length of the long slit that was made in the white paper (this does not need to be exact - just eyeball it). Trim one side of the circle and then insert it into the long slit in the white paper. This is the brim of the hat. D. Cut out a small square from the yellow ribbon. Then cut a smaller square inside that piece to make the "buckle". Set the ribbon against the side of the U-shaped black paper. E. Cut out a small semi-circle using the black cardstock paper and place it on top of the U-shaped paper. This will be the top of the hat. No adhesives required and it took less than 5 minutes to construct. 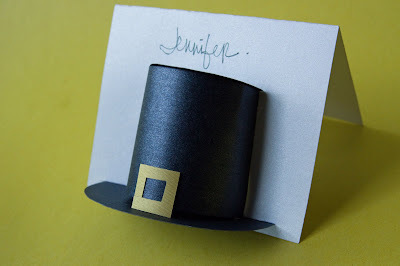 Hope this post helps you avoid place card drama this Thanksgiving! This is so cute! I would love to make these as I'm having a lot of pilgrams on my table this year. Hi Joanne! I wish I was detailed enough to have a template, but I typically create things (including this) on the fly...sorry! But seriously give it a try - it's super easy to make even without a pattern. I think this is a great idea. But, I do not get how the top of the hat, bottom of the hat or the buckle stick without using adhesive. Thanks for the inspiration. Have a Happy Thanksgiving!